Two days ago, I wrote on Facebook that I couldn’t wipe the grin off my face on the first ride on my new, shiny, red bike. As a friend kindly pointed out, I probably shouldn’t have been so brash, because yesterday, it got scraped right off (along with a bit of skin). I didn’t lose consciousness, but the exact chronology of the accident is a bit woozy. I remember shifting into a higher gear to go down a small hill (after having asked my boyfriend whether he wants to have coffee at our usual spot or in the next town), checking the road to make sure there aren’t any cars in front of me or behind me, and swinging a meter into the road in order to pass my boyfriend on the left. Next thing I know, a kid is going back and forth in the road (it wasn’t a pedestrian crossing), undecided whether to stay put or cross, but right when I was going to fly past, it started into my way again. I remember yelling and I can see the ground coming at me while screaming. Lovely. But I don’t remember the impact itself, which is probably better anyway, since I dove head-on at a pretty respectable (but tame for a road bike) speed. In case you’re wondering now: the kid is fine, her bike wasn’t so lucky I heard, but as far as I’m concerned, she shouldn’t have been in the road and she shouldn’t have been wavering back and forth. I was clearly unable to slam the breaks down in time, and in any case, had I done that I’m pretty sure I’d have dived as well. Whether I did brake or not, I cannot tell you. My hands were ON the brakes when I started down that hill, as they always are. Well, I sat by the side of the road (don’t ask me how I got there), told the parents I’m fine (bit of an overstatement) and just focused on breathing. I soon heard both the ambulance sirens and the police talking to my boyfriend and the child with her parents. Apparently, as soon as I was on the gurney (with a stifneck and everything), I asked about my bike three times. My bike was fine – amazingly. I was so worried that I’d mangled it after owning it for all of three days! It has a few scratches on the front brake and the left bar drop seems to be a bit bent, but that is it. Nothing else. I was almost as lucky. With this speed and the type of fall, I could have broken all kinds of things. Instead: a bit of road rash on my hands and the right arm, a big patch of it on my face, a couple of small bruises on my fingers, a pretty bashed up knee (nothing in the joint itself though, luckily) which has swollen quite respectably, and worst of all a really bruised shoulder which is giving me most of my pain. No broken bones, no obvious tears, and nothing on or in my head or my c-spine. They sent me home with a couple of pain killers, the strong recommendation to stay on the sofa for two or three days, and the warning to come back if I feel faint or nauseous. Luckily the ambulance had taken me not to the nearest hospital but to the one closest to my home (1 mile) when they heard where I live. As a biker you have to know and accept the risk of falling. It could have been a branch in the bike lane, someone in front of me driving erratically, or a concealed pothole. As it happened it was another person getting in my way at a really bad time in a place where you’re not supposed to stand on the road. It didn’t matter either that I was in the road and not the bike lane, the day before we were riding quite slowly on a bike lane and two people simply stepped into the lane in front of us without looking. That could’ve gone south, too, but it didn’t. Second, I was really lucky with the injuries that I got away with. Since my mother died of a previously undetected brain aneurysm, I was unbelievably worried that I’d crashed my head so hard. The type of aneurysm she had is inheritable. I told the doctors, of course, and they said they wouldn’t do a contract CT unless I had a severe headache or other signs of distress, which luckily I did not. I got a regular CT of the head and the c-spine though. I shall praise this day as the day I didn’t die the way I’m most afraid of, then. And finally, praise for the health system of Germany. Living here is a privilege. I have health insurance, of course, which covers, well everything (of course), but it really wasn’t a hassle at all. The paramedics asked me about my insurance information, that is it. They didn’t need the card or my ID to confirm it. They didn’t have to ask me about the brand of hospital I need to go to, but took me to the one most convenient for me (had my injuries been worse they’d have taken me to the closest one of course). And finally, all sorts of tests, from blood work to CT, were just done as they were deemed necessary, and I did not worry for a second about the cost of all this. While you’re required to have insurance in Germany – if you’re unemployed or for another reason not able to pay it, the state will pay it for you – they would have treated me exactly the same if I didn’t have insurance or didn’t know the name of it. And I’d have never seen a bill. What a blessing to be so worry-free in situations of distress. So all in all, I now know that falling off my bike isn’t necessarily fatal, it just hurts a bit. I will be back on the bike as soon as my shoulder works sufficiently, until then, no lifting of things, no horseback riding or stablework, no nothing, just TV series, icepacks, easy food and rest. My boyfriend doesn’t come home until Thursday, but if I get worse, he’d be here in a couple of hours. Oh, and I’ll be buying really good insurance for the WCR. Of that I’m painfully certain. I found your blog a few days ago and decided to follow your adventure, as it’s quite uncommon to see young women with such impressive motivation for an insanely huge and exhausting challenge. 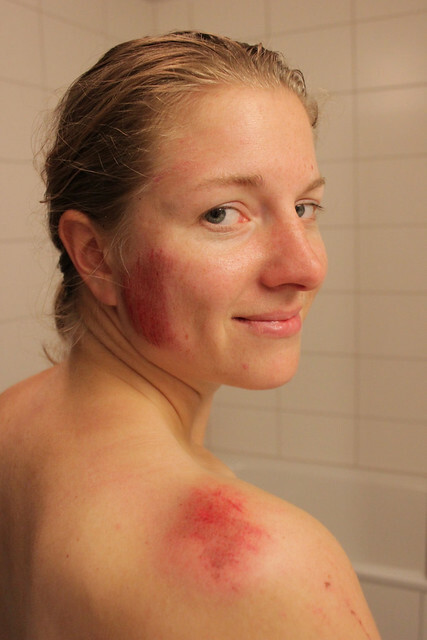 Having made quite a few bike trips in my life, I can assure you that falling off a bike isn’t out of the ordinary. It happened to me while playing with the GPS to intensely, while being attacked by a sheepdog, while being jammed with my partners’ saddlebag in the Chinese desert, hours from the next village. I wish you that you recover well from your injuries and that you lose your fear about accidents. Just make sure that you always wear are helmet and you’ll be fine. You could do squats at home to strengthen your quadriceps until your shoulder feels sufficiently good to go riding again. Good luck for your training!